DO THE HIP-SHAKE BABY! is the brilliant follow-up to harmonica ace BOB CORRITORE’s acclaimed 2018 release, DON’T LET THE DEVIL RIDE. The thirteen songs culled from recording sessions from 2016 to 2018 feature an amazing array of special guests, including Alabama Mike, Sugaray Rayford, Oscar Wilson, Henry Gray, John Primer, Bill “Howl-N-Madd” Perry, Jimi “Primetime” Smith, The Fremonts, Andy T band featuring Anson Funderburgh, Junior Watson, Kid Ramos, Johnny Main, Bob Stroger, Fred Kaplan, Bob Welsh, LA Jones, Adrianna Marie, Nathan James and more! Sterling vocalists, amazing guitarists, killer piano, fantastic rhythm sections, and Bob Corritore’s soulful harmonica to connect it all together. This is a carefully assembled collection of fun loving blues, rhythm and blues, early rock ‘n’ roll, soul and gospel rock songs. Imagine a live-music dance-club in 1968 complete with go-go dancers! Bob refers to this as his Harmonica-a-go-go album! 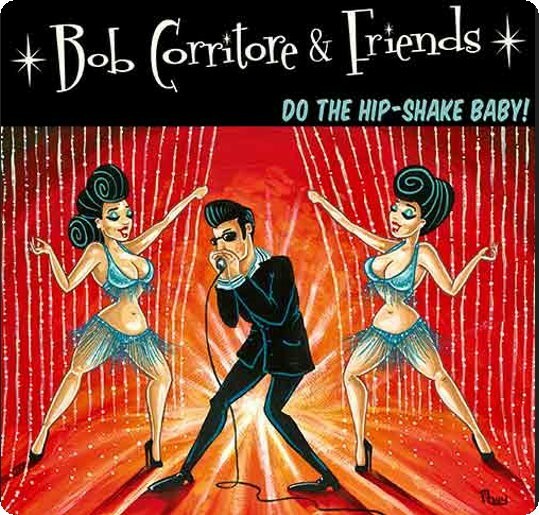 Mixed at Greaseland Studios by Kid Andersen, this the 14th album of Corritore’s illustrious career, and his best yet!